People often say that if you wanted to feel what it was like to live in Yangon 50 years ago, then visit Mawlamyine today! With its colonial buildings, wooden chevrolet buses and its leafy tropical coastal setting, Mawlamyine has a charm of its own distinct from any other town or city in Myanmar. There are also places of historical interest in and around Mawlmayine. Thanbyuzayat, 60 km south is the end of the line for the infamous Burma-Siam death railway where 100,000 people died in its construction during World War II under the Japanese occupation. Kyaikthanlan pagoda on the eastern ridge of town is thought to be the setting where Rudyard Kipling wrote his famous poem, 'The Road to Mandalay'. Win Sein Taw Ya, 30 km south on the outskirts of Mudon is the site of the largest reclining Buddha image in the world. The population of Mawlamyine, being only 150 km from the Thai-Myanmar border, is a melting pot of ethnicities, religion and languages, although still strongly tied to their Myanmar identity. Many of the people in Mawlamyine are bilingual in a number of languages ranging from Mon, Urdu (the language of Indian muslim immigrants who were brought here as labourers during British colonial times) as well as Thai (spoken by many who have tried their hand working in Thailand in or near the border town of Mae Sot and Ranong). A sprinkling of the population can also speak Bahasa Melayu for the same reasons. Because of this, Mawlmayine is a fascinating town to visit from a sociological and linguistical perspective. An undiscovered tourist paradise due to its internal conflicts, Myanmar has only recently opened its doors to the international community. Ancient, beautiful and exotic, this country offers tourists a diverse range of places to visit and things to do. Was built in the 11th Century and is one of the most artistic temples in Bagan in the earliest and finest Bagan architectural style. The huge teak doors inside are from the 15th Century. You may enjoy an early morning trip with a hot-air balloon to see the plains with all the Pagodas and the Ayeyarwady offered by a long established and professional UK operator. This service does not come cheap but is an unforgettable experience. Very often, the flights are fully booked, therefore a pre booking ahead would be wise. Our price for the Balloon-ride is 270.-- USD / Person. There is a peak-season surcharge from 24 December 2009 until 04 January 2010 of 15.-- USD / Person. The price is valid from 1st October 2009 to 31st of March 2010 and includes transfers to and from the Hotel, welcome drinks and some snacks provided by Balloons Over Bagan. We have a special promotion for guests booking Balloons with us until 31 August 2009 for any flight during the next Balloons season starting October 2009! We grant on above Balloon fare a discount of 10.-- USD / Person. The peak-season surcharge remains unchanged. A century old Salay Monastery is situated in Salay town, around 1.5 hours drive south of Bagan. It can be reached by boat or by car. Artistic sculptures depicting the live of Buddha can be seen in this wooden monastery. This mountain can be reached during a day trip from Bagan or on the way to Shan State respectively Mandalay. It is an extinct volcano and known as the abode of "Nats" (spirits). Although Myanmar converted to Buddhism in the 11th Century, animist worshipping is still mixing with Buddhism. Various herbs and plants are growing on the mountain. One can see the panoramic view from top of the steep mountain after mastering the (for some people challenging) ascent. The aggressive monkeys and the dirt however put some visitors off. From the resort with the same name one has a wonderful view. Even one skips climbing to the peak of the mountain, one can still enjoy the nice panoramic view and landscape. The Inle lake is situated 900 m above sea level and surrounded by blue and hazy mountain ranges. Some visitors to Myanmar referred to Inle lake as the "Venice of the East" when going through the canals and villages by boat. There are about 100,000 people inhibiting Inle lake and it's shores. It is 22 km in length and 10 km in the widest place. Various tribal (e.g. Intha, Pa-O and Shan) people's daily life and markets in the lake area are an attraction. Arts and crafts of Intha people can also be seen at Inle lake. Leg rowing is practiced among all the Intha people. The better hotels are either directly on the lake or on its shores. Many of these hotels can only be reached by boat. The main gateway when arriving to the Inle Lake is Nyaung Shwe, which used to be a former capital of a Shan Kingdom. Today there is not much to see aside from the Shan Palace (today Haw Museum) that in foreigner's eyes rather looks like a beautiful villa. It's worth a visit. There are plenty of guesthouses and restaurants in the lower category in Nyaung Shwe. Most devote Buddhists believe the Paung Daw Oo Pagoda to be a very sacred one due to some miracles that happened in the past. The pagoda has five Buddha Images and all are in irregular shape. The legend tells the Buddha images were carved in the 12th Century. Phaung Daw Oo pagoda festival usually held in October is unique and famous for its procession where the Images are brought from village to village. One may be curious why the Intha people row their boats with legs. It is more powerful, and more suitable to use their traditional fishing method by putting a conical shaped fishing trap into the lake. In addition they can see ahead by standing in reedy area. Intha is the only tribe who row their boat with legs. The Indein pagoda complex is situated in the Western part of Inle Lake and most archaeologists believe that the Indein pagodas were built between the 17th and 18th Century. There are about 1000 stupas in the area. The boats navigate a narrow stream upstream to Indein pagoda complex, which is an exciting boat ride and requires great skills in navigating. You may stroll around the pagodas and bamboo forests. On Inle lake there are many birds. There are 18 species of local and 15 species of hibernating birds. In the bird sanctuary ornithologists can observe Herons, King fishers, Cormorants, Egrets, Seagull and Drongos amongst others. Various silk shawls and other clothes are woven in artistic patterns patiently by handlooms. The method is very similar to Ikrat method of Cambodia. The process is very complicated and time consuming. It is worth to visit if one is interested to see hand made fabrics. Inle lake is shallow and weedy. So the people invented their own method to catch fishes. Among the various methods of catching fish is a conical shaped fishing trap as well as pulling a net in the downstream of Inle lake. Inthar catch crabs and shrimps with a small bamboo basket. Kalaw used to be a retreat area in British colonial times due to the cold weather at nearly 1500 meters above sea level. It is still a cool and cozy place with many pine trees. You can see various tribes especially during the market day in Kalaw. The town became famous as a trekking site for day- or overnight trips to the many tribes and villages around Kalaw with Palaung, Pa-O, Danu and Taung Yoe tribes. The Pindaya cave is about 150 meters deep and 8,000 Buddha images are enshrined in it. There are several stalactites and stalagmites in the cave. Most Buddha images date back to the 17th and 18th Century. Various hand postures (Mudra) of Buddha images can be studied in the cave. Shan Paper and traditional umbrella making workshops are also situated in Pindaya area. Driving to Pindaya town from Aung Ban, the landscape is very colorful with various vegetables grown, especially between November and January. There is a beautiful lake in Pindaya. Pindaya is also a starting point for trekking trips to the mountains west of Pindaya, e.g. to Yasagyi village where nights can be spent in a Monastery. This is in the meantime a very touristy place. Aung Ban is situated on the highway from Taunggyi to Yangon. As the area produces many kinds of vegetables and fruits, all the farmers come and sell their goods in Aungban. Aside from market activity, there is not much to see. Heho has the only airport in the Southern Shan State. The town is small, many farmers grow potatoes around Heho, and is also a center of cattle trading. Danu and Taung Yoe tribes live in the area. Taunggyi is the capital of Shan State with a population of 300,000. Trading is the main business, Gems, Cheroot wrapping leaves (Cordia Dichotoma) and garlic are the main commodities. Market day in Taunggyi is very colourful because of the Pa-O tribal people coming from the surrounding hills to town. For those who would like to combine their vacation with charity: There are several orphanages around Inle Lake and in Taunggyi. Some people already support orphanages near Inle, therefore we mention those farther away. Some of the orphanages where you may leave a contribution are. The Christian Orphanage in Taunggyi with about 130 children, managed by two spinsters. Previous guests from America are supporting that Orphanage and have started and association to support on long term and sustainable basis. The Buddhist Orphanage in Taunggyi with about 110 Children, managed by a Buddhist monk. Kakku, in the territory of Pa-O people, is situated 42 km south of Taunggyi. About 2500 stupas, built probably in the 17 to 18th century, are closely aligned in an area of 1 square km. It is possible to hike uphill from Inle Lake to Kakku in a day trip for experienced hikers. The pagoda festival held in March is a special attraction. Cheroot wrapping leaves and garlic plantations are grown in Kakku area. A Pa-O guide is compulsory during the trip. Sanghar is situated a 3-hour boat ride from Nyaung Shwe village. The fascinating boat trip leads to the Southern end of Inle Lake, further through a creek, before widening in a 2nd lake with Sanghar. The attraction are the pagoda ruins from the 17th Century, still not restored, on the banks of that Lake. The area gets sometimes flooded during the rainy season. 200 stupas at Thakhaung village are worth a visit. You can observe the local distillery method in Thakhaung village. On the way to Sanghar, a pottery village and a lotus robe-weaving village can be visited in the Southern part of Inle Lake. We recommend to stay at the hotels in the southern part of the lake as a starting point. The boat ride takes only 2 hours from per way. Sanghar is Malaria area. From February till May the journey may become more difficult due to shallow water. It may become necessary to push the boat at some places. Market days in Shan State are most attracting to tourists who love to see daily live of ethnic people. The Market in a certain place is not held daily but every other five days. The Feudal Lord of Shan State invented the system. The distance between villages and the market places is quite big, so that sellers and buyers cannot come to the market places everyday. This five-day market system is convenient to local people as well as to the sellers. The market rotates from one village to another and comes back every five days to each place. Markets in Shan State also double as community centers where people meet friends from other villages and exchange news. Food, beverages and most necessities can be bough at the markets. The markets are colourful, tribal people wearing their traditional costumes can be seen. Visitors should not miss the market day while being in Shan State. Click here to see the market day schedule. We do not recommend the train as means of transport. There are however a few really attractive routes, e.g. from Nyaung Shwe (near Inle Lake) to Heho / Kalaw. The train continues further to Thazi in the plains south of Mandalay. From the plains around Inle Lake the train ascends steeply into the mountains around Kalaw. Train schedules are never to be taken too serious. departure times get long delayed, sometimes trains may also be cancelled altogether. Please see the schedule as reference only. Sometimes stops at stations can suddenly take an hour. The quality of compartments and toilets are beyond imagination. Despite slow speed, the train swings tremendously. The ride surely is no pleasure for sensitive guests. Near Inle Lake a vineyard was established a few years which also welcomes visitors. The vineyard is located between the Inle Lake and Taunggyi in Aye Thar Yar. Due to a lack of development, Myanmar still offers unspoiled, wide beaches with fine sand and clean water. Fishing villages are beside the few resorts. The entertainment usual in other countries does not exist here yet. A great place for long beach walks, reading books and swimming in the ocean. There are a few beautiful resorts that well fit into the surrounding. At all the beaches, seafood can be enjoyed at very moderate cost. Please dress appropriate at the beaches; local people would often even not wear a normal swimming suite, but rather pants and T-Shirt when swimming. Thandwe beach is situated 30 minutes drive from Thandwe town and can be reached conveniently by plane. The name Ngapali probably derives from an Italian who was reminded of Naples. White sand, blue sky and blue sea will astonish you. The main beach is 2 miles long. On the southern part of the beach there is a fishing village. A few beautiful resorts offer high-quality accommodation. Ngapali is the most popular beach in Myanmar. Ngwe Saung beach is situated to the West of Pathein (Bassein). It is a 5 hours drive from Yangon to the 9 mile long white beach with crystal clear water. The road to Ngwe Saung in the meantime is all the way through concrete. This beach was recently developed and can compare with Ngapali beach. Nice beach resorts invite. Scuba diving is offered by one of the resorts. At most times of the year, there are only few tourists around. The up-market beach resorts are a bit cheaper than comparable resorts in Ngapali. Most of the better Resorts are relative close to Ngwe Saung villages, where there are by now a number of restaurants etc.. Ngwe Saung is however not a typical fishing village. Shortly before Ngwe Saung, there is an elephant camp. Disturbing the otherwise very quiet surrounding are some Jet Ski and motorbikes on the beach.If there is enough demand, there may be flights from upcountry (from Heho) to Pathein. A visit to Ngwe Saung could formerly be combined with a journey on the "Delta Queen", a boat from Yangon to Pathein. The Delta Queen does not operate anymore from middle of 2007! Also Chaungtha (Chaung Tha) beach is situated to the West of Pathein (Bassein), further north from Ngwe Saung. It is also a 5 hours drive from Yangon to Chaung Tha beach, which rather caters for the new Yangon middle class and backpackers. Especially on the weekends, expect many local people coming in big groups, not always staying as quiet as some foreigners would wish. Rather for the adventurer, this beach offers only a government hotel that can't even be booked in advance. The hotel is beyond repair. Kanthaya Beach is a very shallow, 4.5 km long beach and situated 100 km to the south of Ngapali Beach. The sand here is not white. It is a possible to drive from Ngapali to Yangon along the west coast and stop over at Kanthaya. It however is a very long and uncomfortable drive. Around 7 km north of Kanthaya is a small, shallow and lovely bay called Maw Shwe Chaing. There is a private Hotel called Maw Shwe Chaing with ten bungalows. There is a fishing and trading village about 2 km from the bay. It is an ideal place for people who would like to get away from tourists and can do without comfort. Advance bookings are not possible. Located just south of Yangon across Yangon River, Letkhokkon beach is certainly not tempting for swimming due to mud. It is however idyllic and little visited. There was previously a low standard hotel which was closed however. 80 km south from Mawlamyaing and therefore around 10 hours drive from Yangon. Setse beach itself is wide, but the water is not clear, the beach not well kept. There is very basic accommodation. Sittwe used to be a former important port town near the Bangladeshi Border on the Westcoast. The fish auction-market in Sittwe is interesting but smelly and best visited early morning. There is Sanda Muni Pagoda and the cultural museum and one can walk along Strand road with a nice breeze from the sea. Otherwise the town with it's airport is a transit hub for travelers going to the former dynasty of Rakhine (Arakan) kingdom situated 80 km north of Sittwe. The boat trip up on Kitsapanadi (Kaladan) river will take you 5 to 6 hours. Mrauk Oo flourished between the 15th and 18th Century. Tuda of England, Magol dynasty of India and Ayuthaya of Thailand are the contemporary dynasty of Myrauk Oo kingdom. 60 stupas and temples from 15th - 18th century are still visible today. Different styles and architectural concepts in Mrauk Oo will impress visitors. Mrauk Oo market, museum and Rakhine culture are worth to visit. The area does not receive by far as many tourists as Bagan although impressive as well. It can only be reached by plane, although irregular scheduled passenger boats go. Built in Rakhine architectural style from the early 16th century. 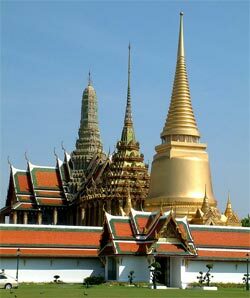 It is said that 80,000 Buddha relics are enshrined on the second precinct of the pagoda. Inside the temple, there are relief sculptures portraying the life of Lord Buddha. Nat worshiping, Hinduism and James ism are all mixing in this pagoda. Situated about 8 km north of Mrauk Oo. It is an old town which flourished between AD 300-900. Some ruined Stupas and an old fort can be seen. After sightseeing in Mrauk Oo one can visit Chin and Mro ethnic villages with their ways of live, dress and daily life. Chin ladies usually tattoo their faces traditionally. The boats going to the Chin villages are not very good. Delays caused e.g. by engine break-downs are possible. Kyaikto town, around 4 hours drive on partly bumpy roads from Yangon itself is a little and sleepy town. From the base camp near Kyaikto, you will have to take a truck with wooden benches on the loading area up the steep and beautiful mountains. From the upper camp, it is still a 1-hour walk to the Golden Rock at around 1100 meters above sea level. Bring a sweater for cold evenings. The way up is tiring if one is not used to walking up. As an alternative, one can ask porters to carry them up on a sedan chair on poles. Don't worry if you feel uncomfortable being carried, in Myanmar it is quite common that older or wealthy people let the porters earn something. There is accommodation close to the Golden Rock, a night stay is recommendable as the atmosphere is best in the early morning or later afternoon. Those desperate for some sweating can go hiking from the base camp up the Golden Rock, taking at least 4 hours uphill. The highlight is a small stupa on a large boulder which seems falling down any moment.Legend has it that the boulder keeps it's balance due to a Buddha hair. Kyaiktiyo is a "must" pilgrimage for any Myanmar Buddhist, probably second to Shwedagon Pagoda in Yangon only. The beauty is to observe the pilgrims praying, lighting candles and putting thin gold leaves on the boulder, which however is only permitted for males. There are plenty of buildings around for religious purposes but also to cater for the many pilgrims. Is the capital of Eastern Shan State and flourishing due to trade with the near Thai border. There are still primitive tribes living around Kyaing Tong where you can do trekking to Ann villages, Akah villages and Palaung villages in day trips. One can observe their exotic way of living (e.g. dyeing teeth), their culture and animistic believes. Tribal people from the surrounding areas attend the daily early morning market in Kyaing Tong and sell their local farm products and handicrafts. Besides the market, cattle is traded, especially buffaloes. Mong La (Mengla) is a border town with China and can be reached by land-route from Kyaing Tong. Hundreds of Chinese arrive in tour buses everyday for activities not allowed in China. The ethnic Wa, who agreed on a ceasefire with the Myanmar army, control the area that claims to be on the way to become a drug free zone. There are large orange, tea and lychee plantations in the surrounding mountains. Tachileik is a bordertown with Mae Sai in northern Thailand. Guests visiting the Chiang Mai / Chiang Rai area can normally enter Myanmar at Tachileik (NEED PRIOR PERMISSION!). Also daytrips are possible, for those there is no visa required. Tachileik has not really much to offer. There is a relatively good road to Kyaing Tong. Pyin Oo Lwin is situated about 70 kilometers (2 hours drive) from Mandalay, up into the Shan Plateau at an altitude of over 1000 Meter above sea level. It is another summer retreat due to its "cool" climate. There is some Nepalese living in the town whose ancestors came there during the British time. The town is known as gardening town due to growing various kinds of flowers. Coffee plantations are located around Pyin Oo Lwin. The town is a transit point on the former "Burma Road" which leads to Muse to the Chinese Border via Lashio. It is a nice and green garden, which stretches over a wide area just on the outskirts of Pyin Oo Lwin. It was recently refurbished by a private company and is worth the entrance fee. There are different "theme gardens", some birds and nice walkways around the pond and in the forest. A silent open "car" can take you around. If you prefer to enjoy the quietness in the garden, the late afternoon on weekends or on weekdays might be the best time for a visit. There are 2 waterfalls around town. Anisakan is a really beautiful one. It can be reached after descending for about 1.5 hours (nearly 300 meters difference in altitude) through a densely plant covered ravine on a narrow and in parts steep path down. The view on arrival is stunning, the waterfall comes down to you from a cliff, and there is a pool on the bottom. The Pwe Kauk waterfalls are very close to the road. It is a short walk to a small and a larger waterfall, which are less scenic than Anisakan but a very popular picnic spot with local people. There is Peik Chin Myaung cave around 45 minutes away from Pyin Oo Lwin towards Lashio is a stalactite cave and contains many small Buddha Images. The cave is easily reached but in times slippery, as usual shoes must be taken off. There are plenty of old buildings visible in town in Tudor and Victorian style. One of the loveliest buildings is the formerly called Candacraig Hotel, today a government run hotel in a big compound. The town is actually quiet large, outside from downtown it is loosely built on. It is worth driving around and enjoying the town. Unlike horse carts in other places in Myanmar, the cabins of horse carts in Pyin Oo Lwin are closed, like one would expect them in an old western movie. You can rent them for a trip, or for a certain time. Hsipaw is on the road between Pyin Oo Lwin and Lashio. A former Shan prince who married to an Austrian Lady had his residence in Hsipaw, today however there is little visible. The old palace is today used as a museum. Most inhabitants of Hsipaw are ethnic Shan. The Gotheik railway viaduct was built around 100 years ago and at that time was a masterpiece in engineering. It is an impressive steel structure over a deep valley. The ride is especially interesting as the train coming from Pyin Oo Lwin stops in front of the viaduct to let an oncoming southbound train pass. To put least stress on the structure, the train crawls over the viaduct in snail pace. You can look down into the deep valley from the train windows. It's a town, which as all have a big central market. Pears and other goods imported from China are sold. One can notice the vicinity to China, e.g. because of Chinese temples. There are hot springs. Muse is a border town to China, naturally a lot of trade is done there. Foreigners can in theory enter from China via Muse with prior permit and can continue to Bamaw via a rough road. The Shweli River forms the border between Myanmar and China in Muse area. On the eastern banks of Chindwin River, situated 136 km from Mandalay, lies another trading town for trade with the western part of Myanmar and India. There are several markets. The town is partly rebuilt as there was a large fire 50 years ago. Aside from trading, people live on logging, Kyauka lacquerware, planting various kind of crops such as rice, beans and peanuts. On the outskirts of Monywa is the famous Lei-Di monastery located who's former head monk was adored by Myanmar Buddhists. A bit out of town is a famous lacquerware manufacturing in the village of Kyaukkha. There is a large copper mine on the other side of the River. It takes around 3 hours from Mandalay by car. Is situated 11 km from Monywa towards Mandalay. It was built between 1939 and 1943. It was built only 60 years ago and features countless Buddha Images and many smaller stupas. It must be taken into account that this Pagoda complex was built during the hardship of the 2nd Worldwar. Usually Lion figures (Chinthe) guard the entrances of Pagodas complex, in this case it's Elephants carved from Stone. The Pagoda was built with reference to to the Pali language Sambodhae rhyme in Buddha's teachings. 6km away is another Pagoda called Bodhitataung. In the outer compound you can see glass mosaic elephants and horses. In the middle compund, there are Buddha images and Nats figures (spirits). In the inner compound, you can see thousands of Bo-trees (Ficus religiosa). Under every Bo-tree, you can see Buddha images mostly in meditation posture. The Chindwin flows into the Ayeyarwady 80 km further downstream near Pakkoku. It is a wide stream through Monywa town. It originates in the far northwestern part of Myanmar and flows 1,000 km through the plains in Sagaing Division in the North East. The Chindwin is the largest tributary to the Ayeyarwady. Shweba Daung is near Po Win Daung (Hpo Win Daung) Caves; one has walk a steep staircase from which you can enter the man made caves. There are standing and lying Buddha Images, a big stone bowl and elephants carved from rock. Most of the mural paintings are from the late Kongbaung Era (around 17th to 18th century). Travelers who go from Monywa to Bagan will reach Pakokku town on the Western Ayeyarwady banks to continue from there by boat to Bagan. The town itself is another trading center for tobacco, cotton blankets and loungyi (The Myanmar "sarong"). There are toy paper making workshops in Pakokku. Alaung Daw Katsapa wild life sanctuary is situated another 90km from Poe Win Hill. You will have to drive on a rough road and continue by elephant ride. There is a lot of wildlife around this area like wild elephants, tigers, and foxes. One can visit Alaungdaw Katsapa Cave. Bagan is the starting point to Mount Victoria. The 3030 meters high Mt. Victoria is a bio-diversified place for nature lovers. Bird watchers can see various birds (e.g. Hornbills). Various kinds of butterflies can also be seen. Rare species orchids and rhododendrons also grow. One can also observe tattooed face Chin ladies at Mindut and Kanpelet town. Is a sleepy colonial town in the delta region where time seems to have stopped. The town is charming and live is much slower than in bustling larger towns. Many people still walk to their destinations or take bicycles. Pathein is a little over 3 hours drive from Yangon. There are small workshops manufacturing monk umbrellas. The night market is very nice; vendors sell food, groceries and fruits. If you have a robust stomach, you can enjoy many different kinds of foods and deserts. Pathein is on your way if you go to either Ngwe Saung Beach or Chaung Tha Beach. It is a 1.5 hours drive North of Yangon. Bago offers many pagodas and is a stop on the road to Mandalay. There are many small "factories", from rolling cheroot (local cigars, done by young girls in incredible speed) to bamboo basket manufacturing and weaving. Some areas in town get regularly flooded in the rainy season, especially during full moon days, when the roads and paths are used as canals for canoes. If one plans to go to Bagan anyway, a visit to Bago probably is not a must. Shwemawdaw Pagoda is located on a small hill overlooking the whole town. The Mon style Pagoda was built with different kinds of umbrellas. The frescos are also different from Burmese style Pagodas. The upper level of the Pagoda was rebuilt in 1930 because of an earthquake. Shwethalyaung features a huge reclining Buddha Statue in an open hall. On the sole of Buddha's feet are 108 features of Lord Buddha. Among the reclining Buddha Images, this Image is said to be an alive-like reclining Buddha Image. There are native birds and also migrating birds and therefore best time to visit this swamp-land is in the cool season (November - end of January) Moeyungyi is about 30 minutes drive north of Bago, close to the road to Mandalay. There is a lodge on the shores, providing simple but cozy accommodation. Only few tourists visit Moeyungyi. Pyay is on the route from Yangon to Bagan on the eastern banks of Ayeyarwady (Irradwaddy) River. It used to be the old capital of Pyu Kingdom between 5th to 9th Centuries. There is unfortunately not much left to see from that period except parts of the old city wall and some prototype Burmese stupas. Shwesandaw Pagoda overlooking the town is a good place to have a view of the Ayeyarwady River. Is located south of Pyay on the western banks of Ayeyarwady. It a 2 hours ride by a rented boat, there are hundreds of Buddha Images carved on the river banks by boat men who stay there overnight during their journey. The boat ride on the Ayeyarwady itself is a pleasant trip where one can see the daily life of the people staying around the river. 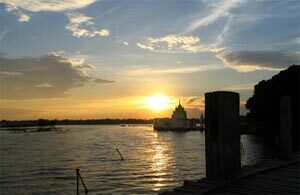 Is a formerly important port town which is mainly populated by Mon, Indian and Myanmar (Burmese). It is a relatively big city stretching far out on the banks of Than Lwin (Salween) River shortly before it reaches the ocean. There is a huge market and a strand road, which could be a perfect walking spot if a few potholes less were on the way. The longest bridge up to date in Myanmar connects Mawlamyaing with Mottama since beginning of 2005 towards Yangon. It is at least an 8-hour drive from Yangon on not always even roads. In the center of town, there is a hill from which one can look over the town, the river and the hinterland. Of course there are a number of Pagodas on that hill. It is amazing to see how green the city is. Looking from above, it seems there is rather forest than a large town. The local buses in town are old-fashioned trucks. Is a small island in the middle of Than Lwin (Salween) River and can be reached with a small long tail boat. It is a pleasant and quiet place, which let you feel spiritual. You can walk around the stupas and the monastery buildings through the garden. Nuns and monks live on this little island. Probably the most sacred pagoda although not especially outstanding from an artist or architectural point, the pagoda is on the hill, overlooking the whole area. You can walk or drive up the pagoda. The museum is worth the entrance fee although one would hope that the glass of the showcases would permit a better view of the displayed items. Buddha Images, music instruments, coins, lacquerware and more from different centuries are displayed. Is a small island in the river mouth which one reach by boat. It is fairly large. There is some handicraft manufacturing, e.g. of smoking pipes. THANBYUZEYAT "2ND WORLD WAR DEATH RAILWAY TERMINAL"
Thanbyuzeyat (Thanbyuzayat) is a 1-hour drive south of Mawlamyaing and marked the ending of the infamous "Death railway". Allied Prisoners of War had to build it during the 2nd World War under Japanese rule. The railway linked Thailand with Myanmar. Today there is little more than a newly painted locomotive on display. On the outskirts of Thanbyuzeyat is a well-kept Allied War Cemetery in large a compound. Previously also known under the name Amherst, it is at the Gulf of Martaban (Andaman Sea) northwest of Thanbyuzeyat. Kyaikkhami Pagoda was built on a small island, connected to the mainland by a bridge-like walkway. During high-tide the lower walkway gets flooded but you can walk on the upper level. The building containing the Buddha Images can't be entered by women, they have to see the Image from a platform. The scenery is probably more attractive than the architecture. A beach 2 hours drive South from Mawlamyaing. For details, please see under "Beaches"
Hpa-An is the capital of Kayin (Karen) State. The town stretches over a large area and is on the banks of the Than Lwin (Salween) River. On the riverbanks, logs are pulled out of the water and are processed in small sawmills. There is a small Lake with Mt. Zwegabin in the distance, a very scenic picture! Hpa-An also offers a museum displaying Karen Culture. Around Hpa-An the Than Lwin river flows through the wide plains, there are plenty of small islands and sand banks in the river. On the river banks farming is done. There are many small jagged rocks in the plains, most of them with stupas or pagodas on top. Boat tours can be done towards Mawlamyaing or north of Hpa-An. There is beautiful scenery to be seen. Rises around 650 Meter steeply from the plains. A pagoda is on top for those who are fit enough to walk up to the top, basically all the way on countless stairs. The way itself is good, no climbing required. The view over the river and the plains compensates for the strenuous walk. You might enjoy a deafening cricket concert; there are plenty of crabs to be seen as well. Amazing enough there are a lot of plants and trees growing in the partly vertical walls of rock. Bayin Nyi Cave is located closer to Thaton town than to Hpa-An, so makes an ideal stop on the way too Yangon. This is another steep Rock in the plains with a monastery at the foot of the mountain. There is a hot spring with bathing possibility. At the end of the rainy season, the area might be partly flooded. It is idyllic and a nice view the monastery around the plains. There are shy monkeys around. Is a bit out of Hpa-An town on the other side of Than Lwin River towards Thaton / Yangon. A cave with many Buddha Images inside and thousands of small Buddha Stucco works on the rocks at the cave. The different Naga ethnic groups from various areas participate in this festival every January. The war like Naga ethnic group wear their full dresses. The festival can only be reached after a several day-long rough journey, organized by the Myanmar Tourism Authority. Individual trips at other times are not permitted. The Naga's way of life and their culture can be observed at the festival. There is also a Naga museum, displaying Naga clothes and historical items. NEED PRIOR PERMISSION - at present not allowed Visits to Mogok are not allowed since the middle of 2005. The highest quality of rubies is mined in this area. The town is situated around 8 hours drive Northeast of Mandalay. Visits to Mogok were not allowed beginning of 2005, might however be permitted again in future. The town has a market where gems are traded.